← KUNWAR KHULDUNE SHAHID. Khan is saying the right things, but can he really deliver? GIDEON RACHMAN. Revenge on the US is sweet for Vladimir Putin. The Russian president draws satisfaction from embarrassing America. The Washington foreign policy establishment has experienced many emotions since the Trump-Putin summit in Helsinki: incredulity, fear, anger. But foremost among those emotions is a profound sense of humiliation. Here was the US president disgracing himself on an international stage, while the Russian president looked on, smirking. For Vladimir Putin, inflicting this kind of embarrassment on America is deeply satisfying. The Russian president’s worldview is built around the idea that the west has deliberately weakened and humiliated Russia for decades. For Mr Putin, it is payback time. To visit Moscow now is to enter a hall of mirrors in which every Russian act of aggression is reflected back, as a necessary response to supposed western aggression. In the US and UK, Russia is seen as a violent state that has annexed Crimea and waged an undeclared war in eastern Ukraine. The Russian response is that the western allies have committed greater acts of aggression in Iraq and Libya and have threatened Russia directly, by expanding the Nato alliance up to its borders. Russia’s annexation of Crimea is portrayed as a defensive measure in Moscow, designed partly to ensure that the Russian navy’s base in Sevastopol never plays host to Nato ships. What about the accusation that Russia has subverted American democracy? The Putinist response (beyond a pro forma denial) is that the US has long attempted to subvert the Russian political system. Hillary Clinton’s explicit support for the anti-Putin protests in Moscow in 2011-2012 was never forgiven by Mr Putin, and may have inspired him to work against the Democratic presidential candidate in the 2016 US election. Viewed from London or Washington, one of the most chilling aspects of Mr Putin’s Russia is the way in which it backs violence, from Ukraine to the UK, and then systematically lies about it. Discussing this tactic with official Russia is difficult, since they will never acknowledge they are lying. But, between the lines, the Putinista defence is twofold: first, that the west lies as well; second, that Russia is under siege, and that deception and lies are a necessary defence mechanism. In that sense, the official Russian line about world affairs is simultaneously completely cynical and utterly sincere. The Russian government is in the business of propagating lies about its own behaviour and the wider world. But it sincerely believes that these lies are justified as part of a broader campaign against western dishonesty and aggression. Yet while corruption runs deep in Russia, that does not mean Mr Putin and his advisers are not also genuine nationalists. As a result, Russia and the west can observe the same set of events and see different things happening. The way in which this plays out struck me while watching the England vs Colombia World Cup football match recently in a bar in Russia. When England were awarded a penalty and several Colombian players were booked, this seemed to me confirmation that England’s opponents were a dirty team who were being justly punished. To the Colombian fans sitting around me, the same set of events proved that the match was fixed and the referee was biased against them. Acknowledging these differences of viewpoint should not mean succumbing to total relativism. Mr Putin and his acolytes are wrong to blame all the setbacks that the Russian state has experienced since 1991 on western plots. The countries that joined Nato after the end of the cold war did so of their own volition because they had a deep fear of Russia, based on their own recent history. The marchers who took to the streets of Moscow in 2011-12 were not American puppets. They were real Russians with real grievances. Similarly, the economic and political chaos in Russia in the 1990s was not “imposed on Russia by the west”, as the Putinist ideology would have it. It flowed from the collapse of the Soviet system and later mistakes by the Russian government. But now the American democratic system — triumphant in 1989 — is itself in deep trouble. Russia, meanwhile, is once again treated by a US president as a peer superpower. For Mr Putin, it is a moment of sweet revenge. For American liberals, it should be a cause for reflection. Much of what has gone wrong in Mr Putin’s Russia flows from its failure to deal with domestic problems in favour of an effort to blame the west for all the country’s woes. Now it is tempting for American liberals to blame Russia for their Donald Trump nightmare. But the real problems, in both countries, begin at home. This article was published by the Financial Times on the 23rd of July 2018. Gideon Rachman became chief foreign affairs columnist for the Financial Times in July 2006. He joined the FT after a 15-year career at The Economist, which included spells as a foreign correspondent in Brussels, Washington and Bangkok. He also edited The Economist’s business and Asia sections. His particular interests include American foreign policy, the European Union and globalisation. 3 Responses to GIDEON RACHMAN. Revenge on the US is sweet for Vladimir Putin. What appears to be a credible case made by Rachman – and echoing that of most other Western commentators – of some equivalence between Russia perceptions and Western perceptions of the same events, is quite misleading. While Rachman may have a reasonable feeling about the Western attitude towards Russia and its leaders, which is based on the same misunderstandings and prejudices as the policies of NATO governments, he quite fails to understand Russians’ attitude to the West. If he had asked those Russians in the bar what they actually thought about “Russian aggression” and the allegations of violent interference in Ukraine or Salisbury he would likely have received a different response – that Russia need not argue its case against the NATO case because these allegations are all untrue. From the trivial and ridiculous claims of interference in US elections, to the mendacious and malicious claims over Ukraine, Syria and Salisbury, there is simply nothing that Russia or Putin should apologise for, nor make concessions over. So Rachman’s opinion has little value, and his presumptions about how the Russian president feels are mere humbug. A strange article, reducing the potential of a nuclear Armageddon, and the slim possibility of peace negotiations between the US and Russia, to a personal issue involving the two leaders. The article thus trivializes the geopolitical factors which have led to the real possibility of the destruction of civilization and the death of billions of people. Interesting piece. When Gideon Rachman is explaining how Russia’s leadership group sees recent years’ international events , I agree with him- it is what I have been writing about Russia since 2016. When he criticises Russian actions, especially in Ukraine and Crimea, I disagree with him: it all depends whom one chooses to believe and who has most credibility, objectively speaking. When Rachman says Putin is revelling in the West’s present discomfort , as payback for all Russia’s hurts and humiliations at the hands of the West over the past thirty odd years, I think he is succumbing to zero-sum thinking. Putin is smart enough t9 see there are non-zero sum solutions of benefit to both sides t9 be had, if the West will only have vision and wisdom to grasp them. This was Putin’s message to the West in Helsinki. . 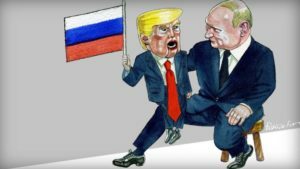 The West, obsessed by a Russiagate, could not – did not want to – see it. Most Western journalists, Rachman ; included, have resolutely indoctrinated themselves not to see this. Which makes this a dangerous time. Incorrect thinking generates unwise acts.